An international audience will attend Frankfurt Book Fair for the 70th time this year. 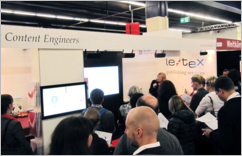 To le-tex, Frankfurt Book Fair is the most important industry event. We have had our own stand since 2009, providing a place to meet with customers, partners, and prospects alike, in order to discuss plans, projects, and ideas. Many industry professionals have attended talks at our booth where we presented technologies and services that we conceived. We appreciate Frankfurt Book Fair as a place to meet peers and friends from our industry, to exchange ideas or just to chat beyond business. Nevertheless, this year we decided to take a stand not to have a stand. This statement, aimed at exerting economic pressure on the book fair not to host right-wing publishers, was made spontaneously and without endorsement of le-tex’s management team. Nevertheless, after lengthy discussions the management and account management teams of le-tex decided to support the statement and what it entails. We decided to bear the consequences by not having a stand at the 2018 book fair, anticipating that Antaios and other right-wing publishers will make an appearance again. Even if we don’t pursue a particular political agenda, we reject discrimination based on people’s ethnicity, gender, faith, or sexual orientation, and we strive for offering all employees a non-discriminatory work environment. As a company, we uphold democratic values internally and externally, and we strictly repudiate radical right-wing thinking. We will therefore not have a stand at this year’s Frankfurt Book Fair. We will nevertheless be happy to meet our customers and partners before, during or after the book fair, in order to talk business and/or shared values. Funds that were dedicated to covering exhibition fees have been re-allocated, namely to Anne Frank Zentrum e.V., Aktion Courage e.V., Buchkinder Leipzig e.V., Courage - Werkstatt für demokratische Bildungsarbeit e.V., Förderverein Tolerantes Sachsen e.V., Netzwerk für Demokratische Kultur e.V. and other organizations that foster education in democracy. le-tex is a leading German publishing service vendor, located in Leipzig, Saxony. Founded in 1999, its almost 200 employees serve publishers and other organizations in the fields of book and journal production, data conversion, and data design.